Brian McRae had had a down year in 1992, his second full year in the majors. He hit just .223, that was after hitting .261 in 1991. But, preparing for 1993, he worked through the winter and started 1993 hot and hit .282 on the year. "He's relaxed. He's confident," McRae's manager with the Royals, and also his father, Hal McRae told The Associated Press after that hot start. "Last year, he fought it all year long, and you can't fight it like that and be relaxed. He's learned to stay inside the ball." 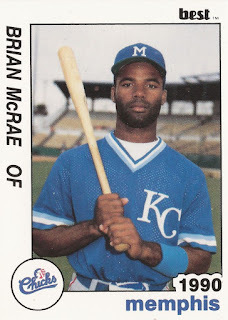 McRae was still just 25 at the start of 1993, but he'd been playing as a professional since the age of 17, taken by the Royals in the first round of the 1985 draft. He was taken by the same team that his father Hal McRae played for. Brian McRae didn't make the majors in time to play along side his father, but he was there waiting when his father was named manager in 1991. Brian McRae first made the majors in 1990, called up directly from AA Memphis. He tripled in his first big league at bat. "To tell you the truth, I couldn't really hear the crowd," Brian McRae told The AP afterward. "My heart was pumping a little and I was just happy to have that first AB over with. After a while, I relaxed and I think I was able to get into the flow of the game." McRae was a regular in the Royals outfield through 1994, hitting .282 in 1993 and .273 in 1994. But it wasn't McRae's improved batting average that he was satisfied with in 1994, it was his RBI total of 69, he told The AP that June. "RBI's are more important to me than hitting .300," McRae told The AP. "I don't think you can find many No. 2 hitters who are driving in 69 runs. I just like being a clutch hitter. I like driving them in when they're out there." McRae signed with the Cubs for 1995, where he started hot, and was responsible for the winning run in an late April game through shear hustle, The Chicago Tribune wrote. McRae stretched a single into a double, stole third and came home on an errant throw. "That was not a team thing, that was all Brian McRae," Mark Grace told the Tribune. "He single-handedly got that insurance run for us. I don't think I've ever played with anybody that exciting." McRae arrived with the Mets in an August 1997 trade, debuting with the Mets with three hits and two runs scored. He stayed with the Mets into 1999, spending time late that year with the Rockies and the Blue Jays, ending his big league career after 10 seasons and more than 1,300 games played.